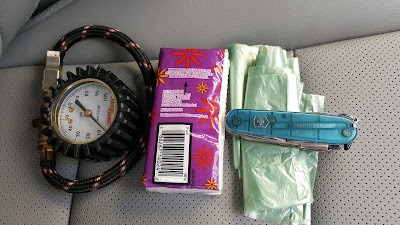 This past weekend a friend mentioned that she was equipping her car with an emergency kit, and knowing my love of all things preparedness, was curious what was in mine. I rattled off some items, but it's been too since I've really considered the question. Not checking in on this sort of thing regularly leads to driving around assuming you don't have something, but do, or worse, assuming you have something but don't. Besides, we have a relatively new car, so it makes sense to do an inventory and make sure it passes muster. Before I dive into a tour of the goodies, here's a few points of philosophy to consider. First, you'll see that for all my chatter about preparedness, I actually try to keep things fairly lean. 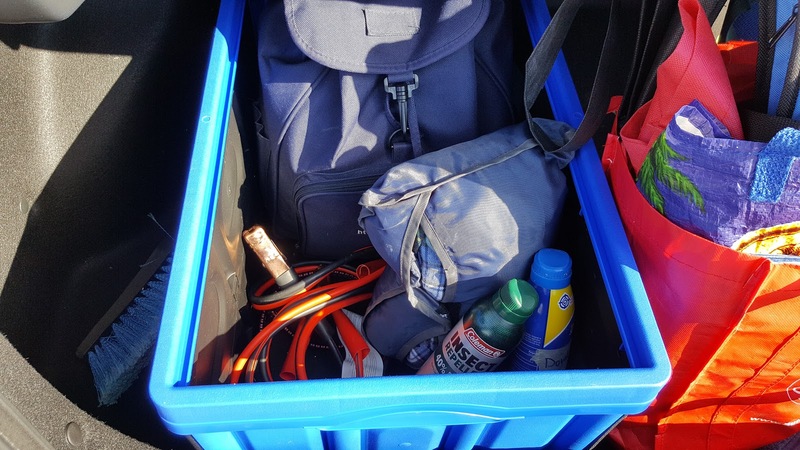 You could easily fill up your car's trunk with items based on What-If scenarios. I try to pick specific scenarios I want to be ready for, and leave the rest to improvisation. Second, I'm not a fan of redundency. If I can carry something in my man-bag, I'll choose that over carrying it in my car. And I can find a way to carry it on my key-ring, I'll choose that over my man-bag. Finally, I hate storing batteries and other perishable items in my car kit. Inevitably, they go bad due to heat, cold or time. First up, the driver and passenger side Oh $#!? Handles have Res-Q-Me's zip-tied into place. 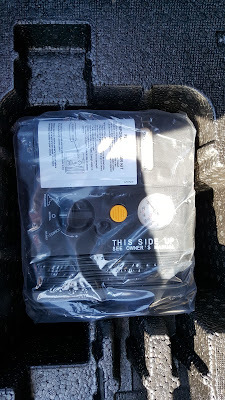 The Res-Q-Me is a vehicle escape device, and according to YouTube they work. Given how cheap, small, effective and valuable they are, I'm fine putting them in the car even if they never get any use. Next up, there are a few essentials in the glove box. Mainly, a Swiss Army Knife, tissues, a tire pressure gauge and some heavy duty produce bags. The produce bags are used as puke bags. I speak from experience when I say they work, and work well. Items include: a large plastic drop cloth, which among dozens of other uses, is handy for dealing with messy passengers or cargo. A neutral colored sweatshirt, which actually gets quite a bit of use when we show up to restaurant that has the AC cranked way up. There's a bunch of glow sticks, which provide a battery free form of light. 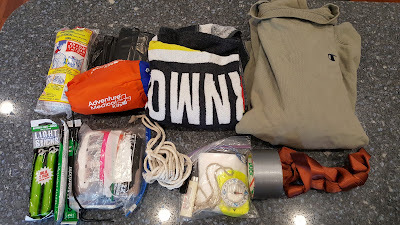 There's one of my Version 2.0 Hiking Kits, which provides first aid essentials, among other things. 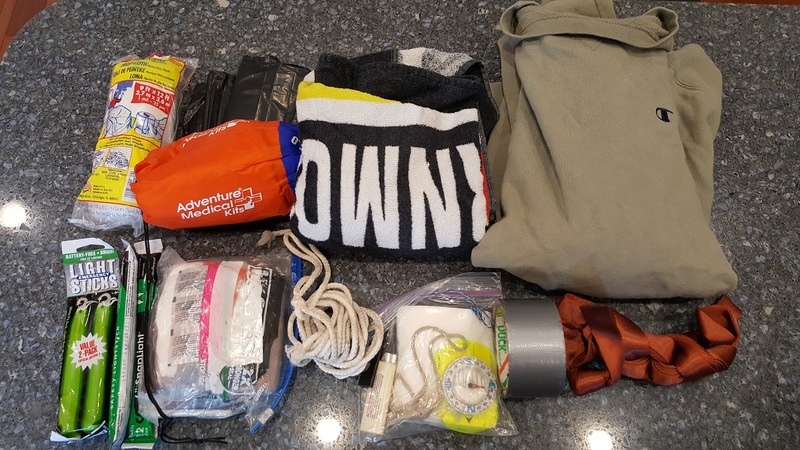 The cord, duct tape, towel and garbage bags are multipurpose items. There's a 15' piece of 1 inch tubular webbing, which is rated to 4,000lbs of force. I imagine this could be useful for an improvised/temporary tow-rope if need be. There's a zip lock baggy with toilet paper, an extra Bic lighter and a compass. Without a compass, how are you going to possibly flee the zombies? Finally, there's an AMK emergency bivvy. Every once in a while we get a nasty enough storm that people are forced to shelter in place in their cars. It's unlikely, but at times like that, the bivvy could be pretty dang essential. Not shown are 6 tea light candles rolled up in a large square of heavy duty aluminum foil. The candles are a battery free source for heat and light. Gone are the days of discovering that along with a flat tire, you also have a flat spare. Whoo! 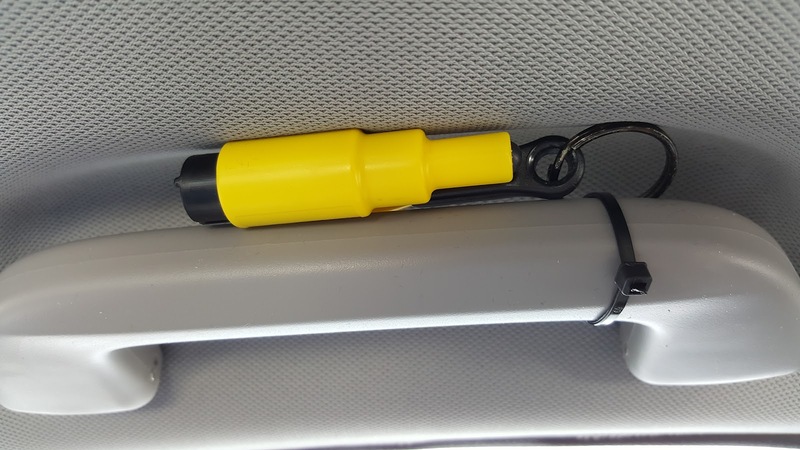 So, let's review: tool to help extricate yourself in a catastrophic car accident? Check. Vomit bag for a car sick kid? Check. Jumper cables to deal with a dead battery? Check. Tire repair kit to deal with a flat? Check. Supplies to make it through a miserable night on GW Parkway awaiting rescue? Check. Duct tape and a pocket knife to conquer all other challenges? Check and check.